In order to increase the confidence in the material model used in your simulation, DatapointLabs introduces CAETestBench™ Validation service. The CAETestBench service is a process in which your material model is validated against a physical part created and tested using a rigid protocol that can be replicated accurately in computer simulation. Thus, it is possible to probe the accuracy of a material model to quantify its ability to replicate real-life simulations. The deformations range from simple tensile modes to more complex multi-axial modes, impact and failure. Here is how an open loop validation can be used to probe the accuracy of the material model itself. A physical test is performed on a complex geometry, using DIC (digital image correlation) techniques to capture the experimental results precisely. Then a simulation of the test is performed using the specified material model and software package. Finally, the simulation results are compared to the physical test results to provide a quantitative assessment of the material model performance. Currently, Falling Dart Impact Validation is available for the LS-DYNA MAT_024 model, or the Abaqus *RATE_DEPENDENT model; Ribbed Plate Flexural Validation is available for the Abaqus *Elastic *Plastic model, or the ANSYS MISO model; and Torsional Crank Validation of Additive Material Models is available for Abaqus or ANSYS. The CAETestBench Validation service is subject to some prequisites and limitations, as specified in the Test Catalog. See www.testpaks.com for more information about TestPaks and CAETestBench Validation services by DatapointLabs. Preliminary results forming the basis of this work were presented at technical conferences earlier this year; for example, see Comparison of Crash Models for Ductile Plastics, presented at the 10th European LS-DYNA Conference in Wuerzburg, Germany; and Finite Element Analysis of Additively Manufactured Products, presented at the ANSYS Conference & 33rd CADFEM Users’ Meeting in Messe Bremen, Germany. Knowmats is a new online resource for knowledge related to materials and simulation. The goal is to assemble a curated collection of information that helps simulation professionals perform best-in-class simulation with a better understanding of how materials are represented in FEA and CAE simulations. Contributors include simulation professionals, CAE and finite element software companies, material modeling experts and others who are willing to contribute their expertise to improve the field. Paul Du Bois is an independent consultant in the field of industrial application of large scale numerical simulations. He specializes in the application of explicit integration techniques for crashworthiness and impact problems. Dr. Helmut Gese is the founder of MATFEM, an organization that offers technical and scientific services for industrial companies in the fields of material sciences and finite element methods. Massimo Nutini, Ph.D., is a CAE Engineer at Basell Poliolefine srl, a Company of LyondellBasell Industries, developing new methods in mechanical characterization and numerical simulation for polymers; he also lectures in applied thermodynamics at the Politecnico of Milan, Engineering faculty. Check out the Knowmats site for yourself, whether you're looking for information about materials in simulation or thinking of contributing your relevant expertise. 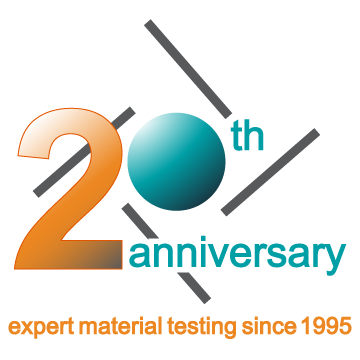 DatapointLabs is celebrating 20 years in business throughout 2015. So far this year, we've continued our leadership in material testing, becoming the first commercial laboratory in the US to offer very high speed tensile testing to measure data at strain rates as high as 1000 /s (see Datapoint, vol. 21.1), and adding CAETestBench™ material model validation services to our Test Catalog. We've also introduced a well-defined family of affiliated brands whose collective purpose is to strengthen the materials core of manufacturing enterprises, including the new Knowmats site, described above. DatapointLabs employees, families, and friends celebrated our 20th anniversary with a lakeside barbecue at Taughannock Falls State Park. Our multi-talented staff joined in to enhance the musical entertainment! Here are Will Liguori (left) on bass guitar, and Adam Beckwith on the drums. We also say goodbye to our first retiree. Scott Kumpf, our longtime Sales Director, has retired as of the end of July after 15 years with DatapointLabs. Our clients will miss his understated approach to doing business, and we all will miss our colleague's relaxed attitude and sense of humor, to say nothing of his effectiveness as a salesperson! We wish Scott nothing but the best as he relocates to Texas to be closer to his grandchildren! We sent Scott (front and center!) off with a festive lunch at the Fargo Bar & Grill in Aurora, NY. Scott was upbeat, as usual, and looking forward to his new status. What do you get when you order material testing at datapointlabs.com? For a limited time, when you log in to your MyLab account at datapointlabs.com and place an online* order using the Instant Quotecapability, you'll receive an Amazon e-gift card when your order is delivered. *This offer is not applicable if you order by telephone or e-mail.